This tutorial is intended to give new modders a basic understanding of how to use modding tools. 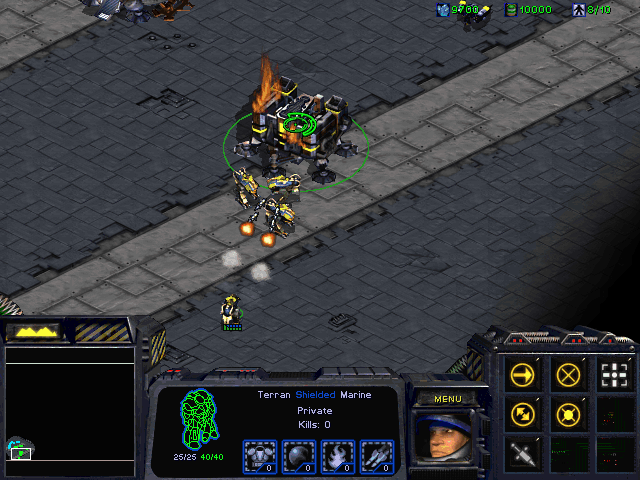 It is by no means a comprehensive look at modding StarCraft, but is intended as a series of first steps for absolute beginners. Post has been edited 5 time(s), last time on Sep 4 2017, 12:07 am by Voyager7456. What is a StarCraft mod? Mod is short for modification, and they change aspects of StarCraft, from the graphics and weapons units use, to abilities and even the objectives of the game. 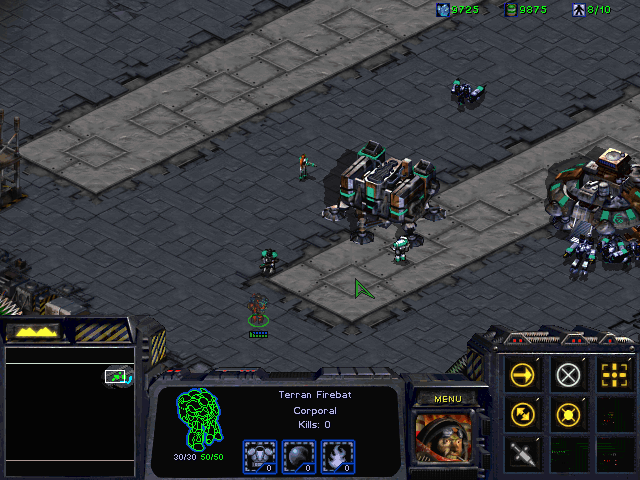 Through modding, you can customize StarCraft to your heart's content. Some mods add or tweak just a couple units. Others are large total conversions that completely replace the races from the base game. How do I play a StarCraft mod? Most mods are packaged as executables. You simply need to double-click the mod executable to start the game. The caveat is that most mods are only compatible with a specific version of SC. The majority of mods require 1.16.1, although some older mods will require older versions. How do I get an older version of StarCraft? You will need to install a copy and then patch it manually to the correct version, or use a program like SCDG to change versions for you. 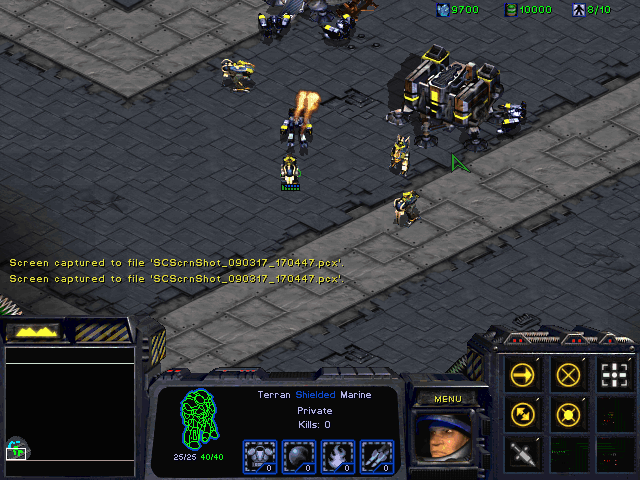 Pre-1.18, a StarCraft install can be freely converted to any other version without issue. However, a 1.18 install cannot be converted to an older version. You can find the StarCraft client here. How do I play mods with other people? The first thing to do is make sure that everyone is running the mod. Players who are not running the same mod as each other will desync very quickly. Download and run the registry file. Select the ICCup gateway when starting a multiplayer session. Your account credentials will be the same as the ones you registered with on ICCup. What do I need to start making StarCraft mods? Python Modding Suite (PyMS): A comprehensive collection of modding tools in one easy download. You can find instructions on downloading and installing PyMS here. FireGraft: This tool is used for editing button sets, as well as packaging mods into convenient executables. There are other, more specialized, tools for specific tasks, but these two packages will allow you to do the bulk of modding tasks. 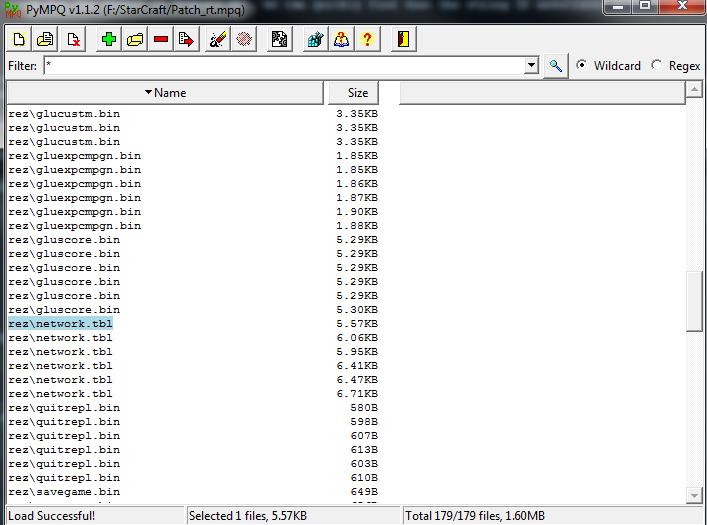 .dat files control the characteristics of most things in StarCraft. What graphic does a unit use? What weapon does it have? How much does it cost? All of these things are controlled through the .dat files. The tabs at the top each correspond to a different .dat file. Basic - Base statistics of the unit. Advanced - Unit properties, such as Detector and Mechanical, as well as characteristics like permanent cloak or health regeneration. Graphics - What graphic the unit uses, as well as its size in game. StarEdit - How the unit is treated in the Campaign Editor, as well as the placement box for buildings. AI Actions - How the unit AI behaves ingame. Weapons - Characteristics of weapons, such as damage, cooldown and range. Flingy - Speed of units and projectiles. Every unique graphic in the game has its own flingy.dat entry, which can be shared by multiple units. For example, the "Marine" flingy is shared by both the Marine and Jim Raynor (Marine). Sprites - Size of the health bar and selection circle for a graphic. Images - The graphics file, animation and palette used for an image. Upgrades - Statistics for upgrades. Techdata - Costs associated with using and researching spells. Sfxdata - Characteristics of the sound files used ingame. Portdata - Characteristics of the portrait files used ingame. Mapdata - Where the map files are located for campaign missions. Orders - Characteristics for unit orders. If you're ever unclear about what a flag or value means, hover your mouse over it and PyMS will provide an explanatory tooltip. Giving shields to the Terran infantry units. Turning the Ghost into a long-range sniper unit. Start by selecting the Marine from the list of units on the left. Each unit has its own units.dat entry. When selected in the list, the unit's properties are displayed on the right. 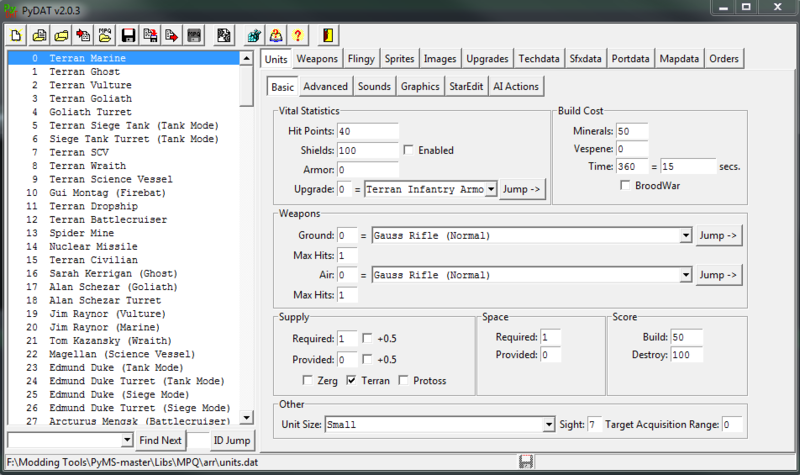 To give the Marine shields, simply check the "Enabled" box next to Shields in the Vital Statistics box. We can easily repeat this process for the Ghost, Medic and Firebat. You can find their entries by either scrolling through the list, or by using the search bar at the bottom. You can also use the "ID Jump" button if you already know the ID of the unit, which is displayed to the left of the unit name. Before going any further, we should save our progress. Press the save button in the toolbar and save this file as units.dat. It is recommended that you create a directory somewhere to store all of the files in your modding project. Let's move on to our next objective, which is to turn the Ghost into a long-range sniper. To do this, we are going to modify the Ghost's weapon, as well as change its graphic. After selecting the Ghost, click on the graphics tab and change the Ghost to use the Sarah Kerrigan graphic and portrait. After doing this, go back to the Basic tab and click on the "Jump" button next to the Ghost's weapon. This will take us directly to the weapons.dat entry that corresponds to the Ghost's C-10 Concussion Rifle. There are a number of properties here, most of which are pretty straight-forward. In this case, I have chosen to increase the range and damage of the Ghost's weapon, add splash damage and change the icon and hit graphics. 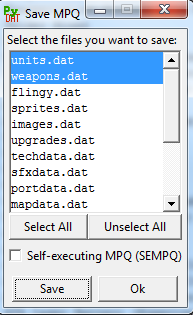 Save this file as "weapons.dat" and then we will be ready to move on to the final step. Go back to the Units tab, find the Firebat and click on the Advanced tab. 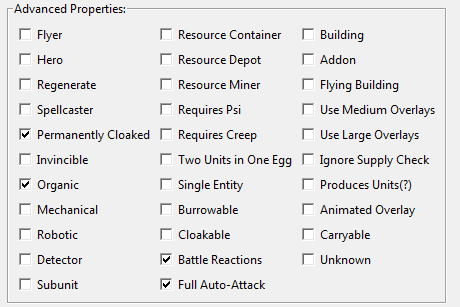 Under the Advanced tab, you will see a number of checkboxes for unit properties. In this case, let's check "Permanently Cloaked" and then save. We're now ready to test our changes! Select the two .dat files that we modified, then click Save. Save this as "mymod.MPQ" in your working directory. PyDAT does provide the option to generate a self-executing MPQ by clicking the checkbox, but if your SC installation is a little wonky (like mine is) you may find that SEMPQs don't work properly. Instead, we're going to use FireGraft to package the mod into an executable. Don't worry about what any of these tabs or values means, right now all we need to do is click "File->Save". 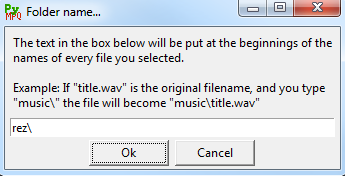 You'll get a dialog box asking you if you want to copy an archive into the file. Click Yes, then select the MPQ file we saved earlier. You should now have an EXE file in your directory. Double-click it to run your first mod! If FireGraft cannot find your SC installation, you may get a dialog box asking you to "Select StarCraft Executable". In this case, browse your your StarCraft installation directory and select StarCraft.exe. Start a game as Terran, and you should see all of our changes taking effect! Congratulations! 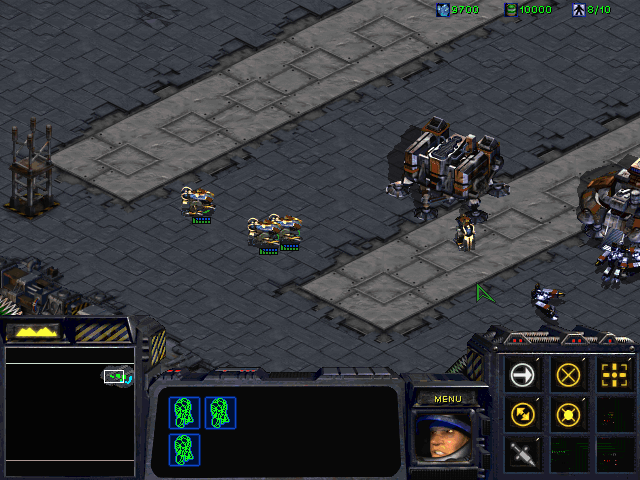 You've now taken your first step into the world of StarCraft modding. Next up, we'll look at how to change in-game strings. stat_txt.tbl - This file contains the majority of strings: unit and weapon names, button tool tips, error messages, etc. network.tbl - Contains strings related to multiplayer, as well as faction and race names. images.tbl - Contains the path names for the graphics files. Edit the name and buttons of the Terran Infantry to reflect our changes. Edit the name of our edited Ghost weapon. Change the name of the Terran faction. As with PyDAT, the strings are listed on the left and edited on the right. Let's select the first string and examine its components. 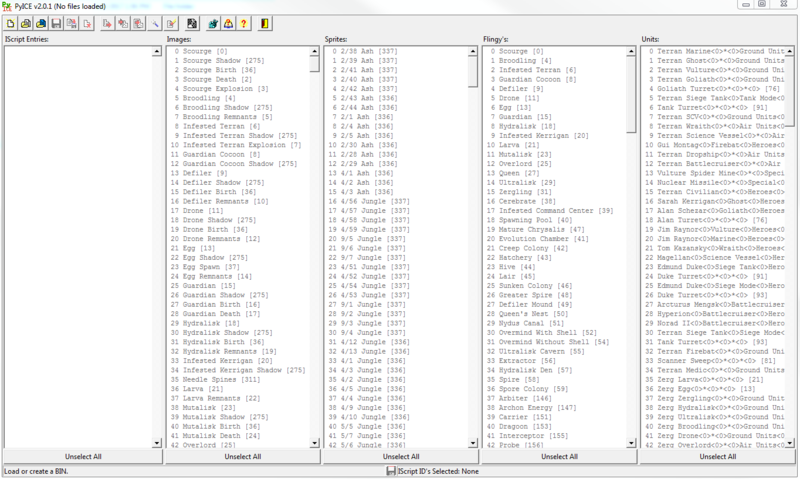 The first 228 entries in stat_txt.tbl are dedicated to the unit names. Each string here corresponds to the appropriate entry in units.dat. A unit name has three substrings, divided by the code <0>. 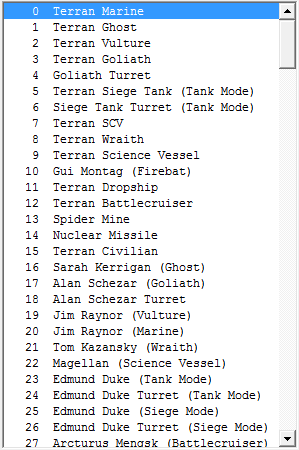 The first one (Terran Marine) is the name displayed for the unit in-game. The second (*) is shown in the editor next to the unit name, but not displayed in-game. For example, when using StarEdit, Gui Montag<0>Firebat<0> will show up as Gui Montag (Firebat). However, in game the player will just see Gui Montag. 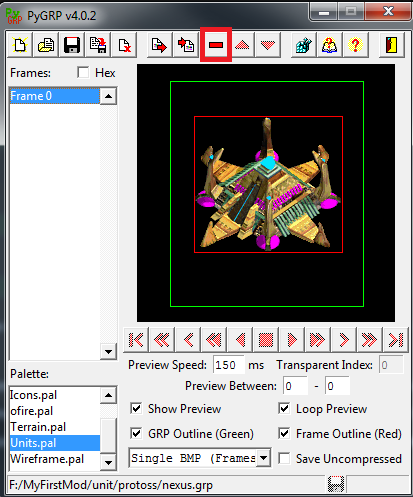 The final portion is the folder for the unit in the editor. 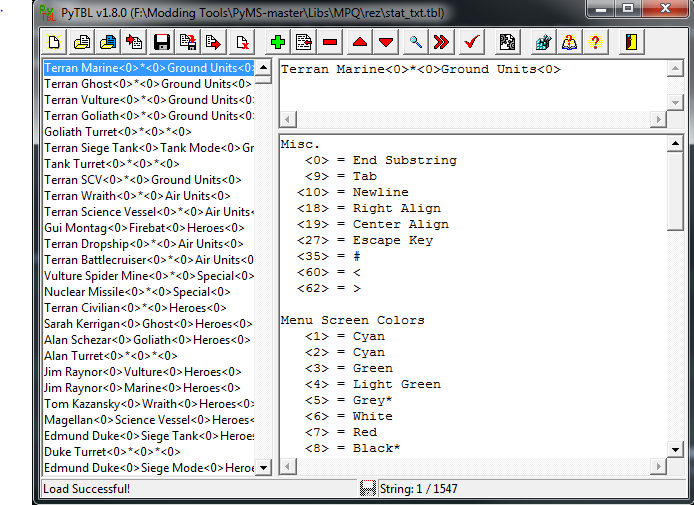 So the Terran Marine will appear in the Ground Units folder in StarEdit. The end substring code (<0>) is not the only special syntax recognized by the TBL files. If you examine the pane in the bottom right of the window, you can see others listed. For example, there are color symbols that you can use to color unit names and tooltips in-game. This should appear as "Terran Shielded Marine" in game. When you use a color code like <14>, the rest of the string will be displayed in that color. Therefore, if you want to only color part of a string, don't forget to use <1> to go back to the default text color. Note that some colors, marked with a *, cannot be overriden once used. Go ahead and change the rest of the Terran infantry units as well. It's not enough to just change this first entry for a unit however, you will also want to change two more strings - the build string and the requirement string. Let's find those for our Terran infantry units by using the Find dialog (Ctrl + F). Here we see what a typical string for a button looks like. The first character is the hotkey for that button - in this case, pressing "m" will activate the button to train a Marine. <0> - Label Only. Do not display any additional information. <1> - Resources and supply. This is the button for training a unit, show the minerals/gas/supply costs associated. <2> - Upgrade research. Show the mineral/gas cost for researching this upgrade. <3> - Spell. Show the energy cost for casting this spell. <4> - Technology research. Show the mineral/gas cost for researching this spell. <5> - Resources, but no supply. Show the mineral/gas cost for training this unit, but not the supply. This is used for things like the Guardian morph since the supply cost has already been paid. Following the hotkey type, there's the actual text of the button. Note that the color codes have been used here to make the M in Marine appear yellow. This is a helpful indicator to the user what the hotkey is for a button, but is not required. Finally, the string ends with <0> as all strings should. You may be wondering where the Medic string is. 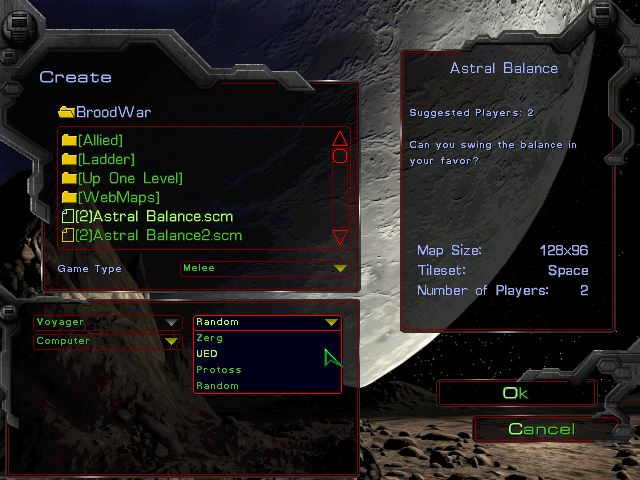 If you use the search function, you will find it all the way at the bottom of the file - all of the strings added in Brood War have been appended to the end, and are not near their counterparts from the vanilla game. There's one more thing to do, which is to change the requirement string. If you scroll or jump to entry 701, you'll find the start of the requirement strings. These are what is displayed by a button that you can't activate because you lack some unit or tech prerequisite. Notice that the Marine does not have a requirement string. That's because there is no prerequisite for Marines by default. What if we wanted to add a prerequisite for the Marine? 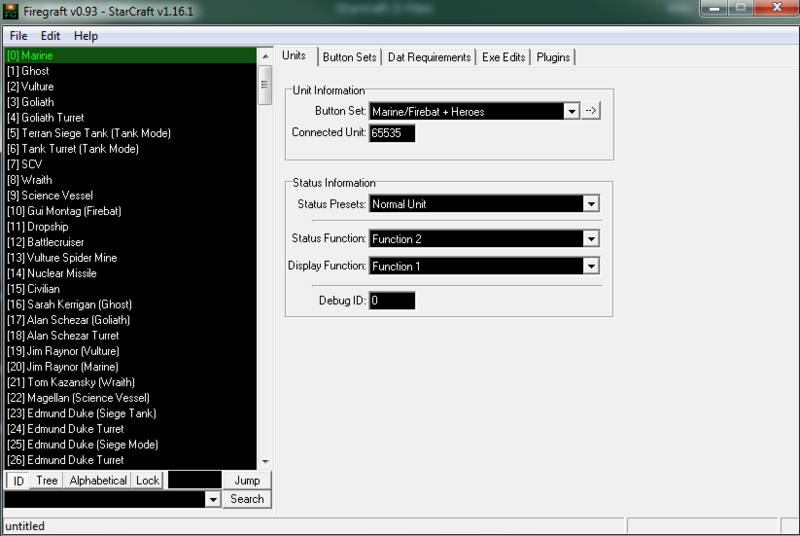 We'll talk about that when we start editing buttons and unit prerequisites at a later part of the tutorial. Looking at the entry for the weapon in weapons.dat, we can quickly find that the string ID associated with this weapon is 231. 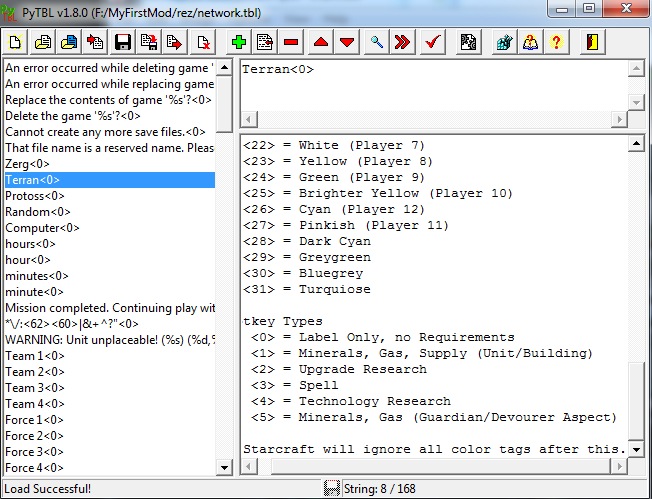 Go ahead and change it in stat_txt.tbl, then use the "Save As" button to save a copy in our mod directory. Make sure not to just save the file, or you will overwrite the default TBL file used by PyTBL. Why are there so many copies? Some files have multiple copies with different Locale IDs - different versions for different languages of the game. The top file should be the one we want, so right-click that one and click Extract. Once it is extracted to a folder, let's open it with PyTBL. This file is much smaller than stat_txt.tbl, and mostly contains strings related to multiplayer and the actual hosting of games. The four race names begin with ID #7, let's change Terran and save the file. Now that we've finished editing our strings, we have to package the .tbl files into our MPQ archive. You can see the two .DAT files we've been editing are listed here under the directory arr\. 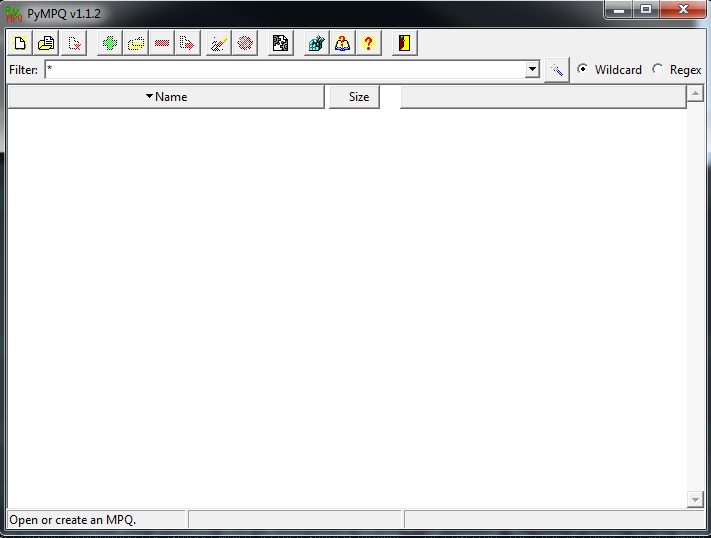 There is also a listfile, which tells programs what the names of files in this MPQ are. When adding files to an MPQ, it's important they are added at the right path. 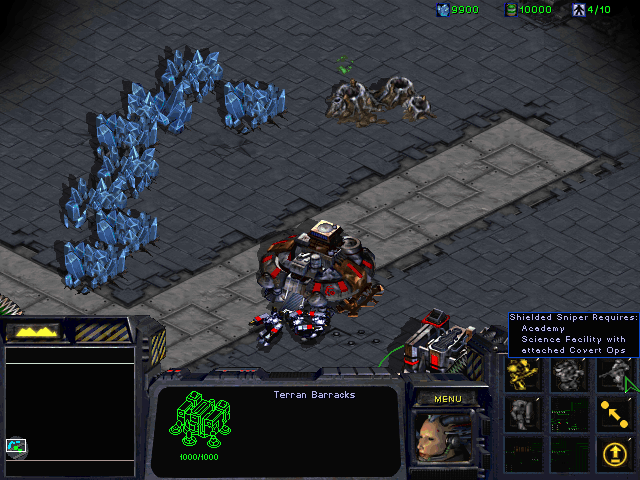 For the most part, StarCraft will look for files in specific, predetermined locations. If our units.dat file were not located at arr\units.dat, it would not be applied. Click the "Add files" button and add our modified stat_txt.tbl and network.tbl files. When PyMPQ prompts you asking for a folder name, enter "rez\". This will automatically prepend it to the name of the file, placing it in the path we need it to be at. In the next part of the tutorial, we'll look at the first step in replacing unit graphics and do some simple GRP editing. Post has been edited 1 time(s), last time on Jul 20 2017, 3:47 am by Voyager7456. 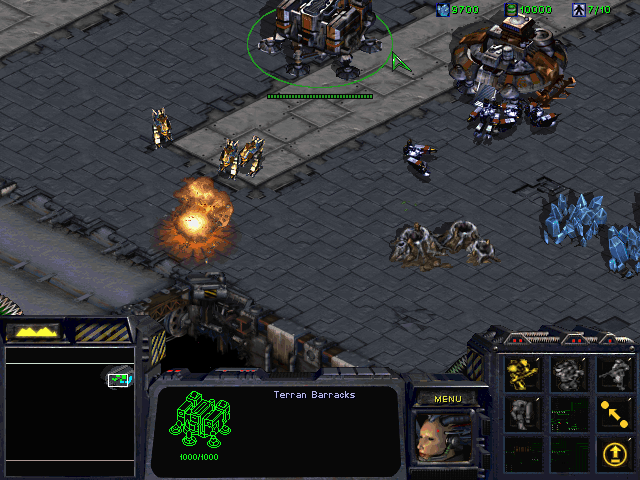 .GRP files are the files used by StarCraft to store in-game graphics - whether they are units, buildings, weapons, graphical effects or icons. 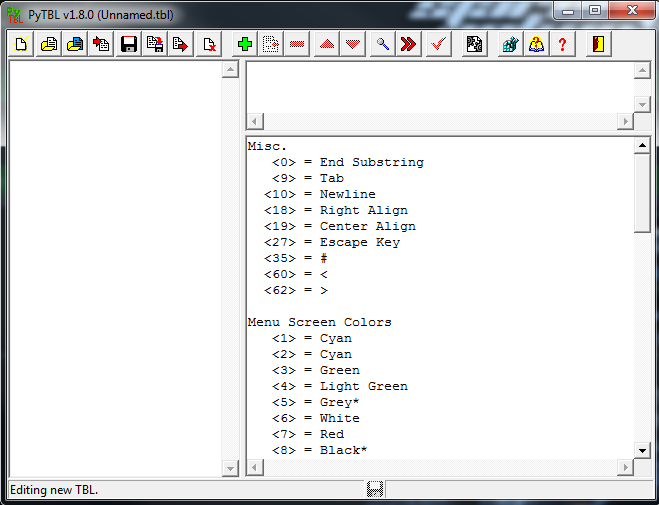 Nearly everything visible in-game has a .GRP file associated with it. .GRP files can be thought of as a series of frames. Tools like PyGRP can convert a .GRP file into a series of bitmaps, and vice-versa. Before we begin creating our own GRPs, let's take a look at some of the ones that come with StarCraft. Let's use PyMPQ to open StarDat.mpq, which can be found in your StarCraft directory. You should see a massive list of files before you. Scroll down until you can find unit\protoss\nexus.grp, and extract it by right-clicking on it and clicking "Extract." The *fire palettes are translucent and are used for things like weapon effects and explosions. Most of the time, however, you'll be working with the unit palette. 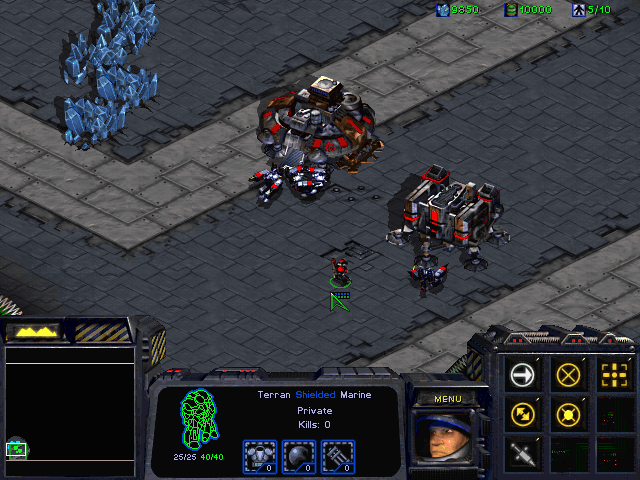 In StarCraft, units that turn, such as the Scout, can face 32 different directions. The first 17 frames of the Scout GRP are what's called a "frameset" - the same frame in the animation, just rotated facing different directions. A frameset consists of 17 frames, starting with the unit facing directly north and rotating clockwise 10.5 degrees per frame until it faces due south. You'll notice that there are no frames in the GRP of the Scout facing to the left. Instead, the engine just horizontally mirrors the frames to fill in those directions. Notice that there are pairs of frames that are exactly the same. Ground units only face 16 distinct directions, and the frames are duplicated to fill in the rest of the frameset. 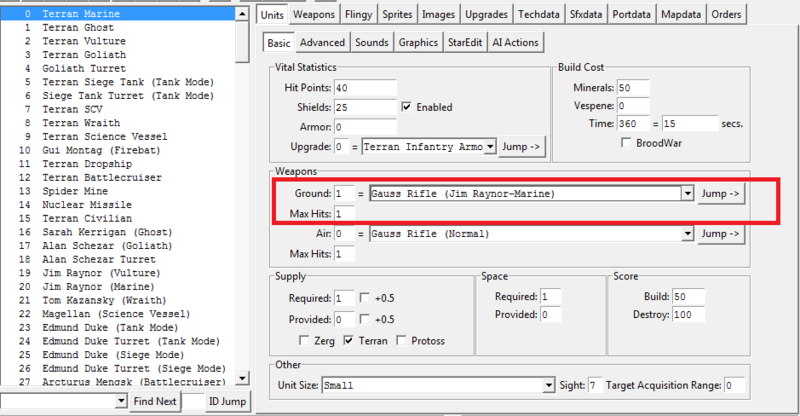 Use the Jump 17 Frames button to walk through the different framesets of the Marine. You will notice that they are organized into distinctive animations - the first 4 framesets are the Marine's firing animation, the next 9 make up the walking animation. The final frames (221--228) make up the death animation. However, Marines don't have distinct death animations for each direction they might be facing. You may be wondering - how does SC know when to play each frameset? How does it know that the Marine death animation does not have different directions like the rest of the GRP? These things are controlled by iscript.bin, which we'll cover in the next part of the tutorial. For now, let's learn how to edit GRPs within the confines of the animations that already exist. Now that we know a little bit more about how GRPs work, it's time to edit them. For this example, I'm going to be editing the Nexus and Scout graphics. Let's open nexus.grp once again. The first step in editing it is to extract the frames. You can do this by selecting the frames on the left, and then clicking the "Export selected frames" button. These are the only colors that we can use in our Nexus graphic. Using other colors will not display properly in game. And worse, if we fail to save the bitmap in the correct 8-bit palette mode, the graphic may not render at all. 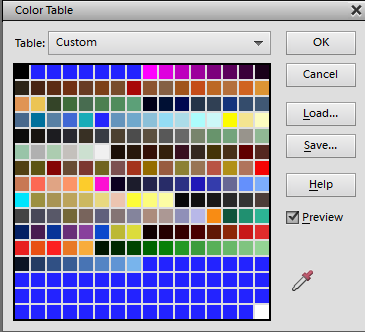 Fortunately, there are many graphic editors that let you specify a palette when working on images, such as GIMP or Photoshop. You can find the palette files on poiuy_qwert's Github, after which you can import it into the graphic editor of your choice. Just search for "import palette + [editor of your choice]" and you will likely find instructions on how to do so online. 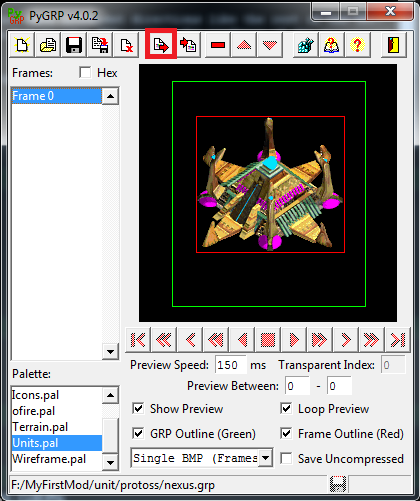 When editing a more complicated graphic, like the Scout, you may find it beneficial to export the frames as a single image, rather than a series of .BMP files. 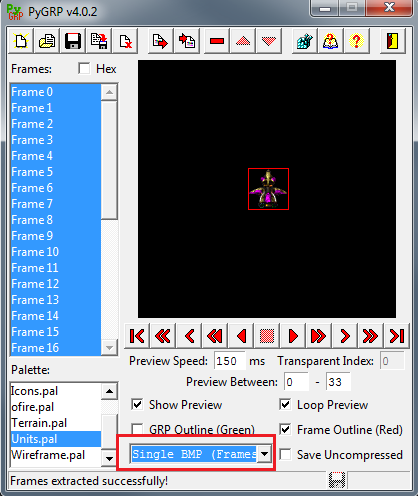 To do this, simply change the dropdown menu at the bottom from "One BMP per frame" to either of the "Single BMP..." options. 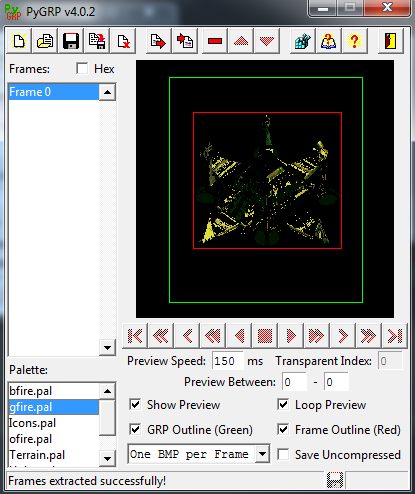 Rather than generate 34 different files for the Scout, this will generate a single image containing all of its frames. 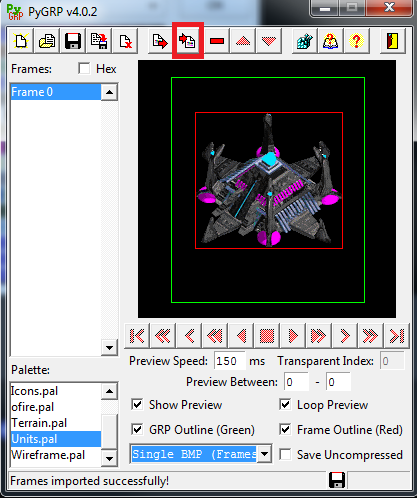 As long as you enter this correctly, PyGRP should have no trouble parsing multiple frames out of a single image. Now that we have some basic knowledge of how GRPs work, let's move on to making our own animations in the next part of the tutorial. Post has been edited 1 time(s), last time on Jul 20 2017, 9:49 pm by Voyager7456. In the previous part, we examined the GRP files and saw that frames were organized into framesets. 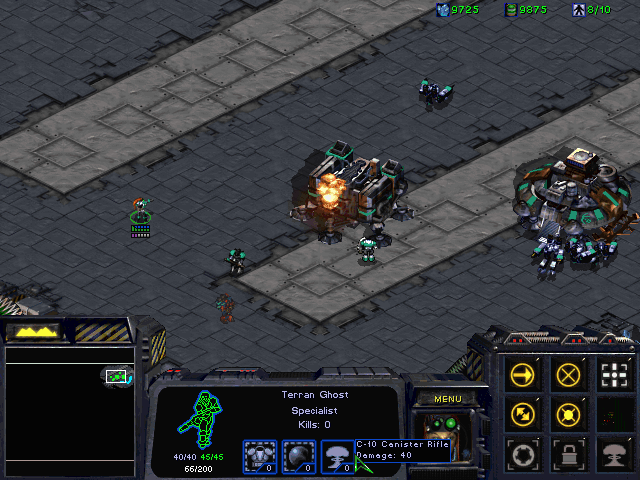 Furthermore, animations were made of multiple framesets - for example, the Marine's firing animation consists of the first 4 framesets in the GRP. But how does SC know what framesets to play when? The other columns (flingy, sprites, units) are provided for convenience to help you jump to useful entries quicker. Animation List - A list of animations and their associated labels. For example, "Init MarineInit" tells SC to jump to MarineInit when it needs to play the Init animation. Comments - Everything after a pound sign (up to the end of line) will be ignored by StarCraft, allowing you comment scripts for readability. Labels - Labels that indicate points to jump to in the script. These are written in the format "label_name:" and should be unique. playfram - <frame#> - displays a particular frame, adjusted for direction. 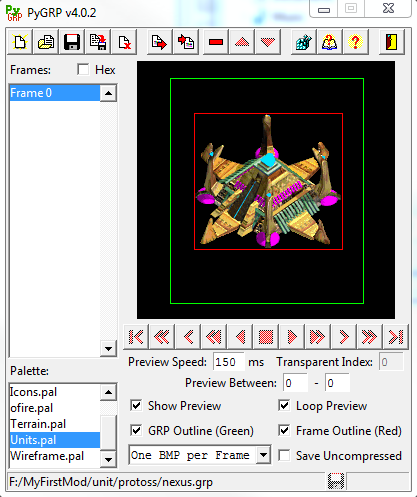 playframtile - <frame#> - displays a particular frame dependent on tileset. sethorpos - <x> - sets the current horizontal offset of the current image overlay. setvertpos - <y> - sets the vertical position of an image overlay. setpos - <x> <y> - sets the current horizontal and vertical position of the current image overlay. wait - <#ticks> - pauses script execution for a specific number of ticks. waitrand - <#ticks1> <#ticks2> - pauses script execution for a random number of ticks given two possible wait times. goto - <labelname> - unconditionally jumps to a specific code block. imgol - <image#> <x> <y> - displays an active image overlay at an animation level higher than the current image overlay at a specified offset position. imgul - <image#> <x> <y> - displays an active image overlay at an animation level lower than the current image overlay at a specified offset position. imgolorig - <image#> - displays an active image overlay at an animation level higher than the current image overlay at the relative origin offset position. switchul - <image#> - only for powerups. Hypothesised to replace the image overlay that was first created by the current image overlay. __0c - no parameters - unknown. imgoluselo - <image#> <x> <y> - displays an active image overlay at an animation level higher than the current image overlay, using a LO* file to determine the offset position. imguluselo - <image#> <x> <y> - displays an active image overlay at an animation level lower than the current image overlay, using a LO* file to determine the offset position. sprol - <sprite#> <x> <y> - spawns a sprite one animation level above the current image overlay at a specific offset position. highsprol - <sprite#> <x> <y> - spawns a sprite at the highest animation level at a specific offset position. lowsprul - <sprite#> <x> <y> - spawns a sprite at the lowest animation level at a specific offset position. uflunstable - <flingy#> - creates an flingy with restrictions; supposedly crashes in most cases. spruluselo - <sprite#> <x> <y> - spawns a sprite one animation level below the current image overlay at a specific offset position. The new sprite inherits the direction of the current sprite. Requires LO* file for unknown reason. sprul - <sprite#> <x> <y> - spawns a sprite one animation level below the current image overlay at a specific offset position. The new sprite inherits the direction of the current sprite. sproluselo - <sprite#> <overlay#> - spawns a sprite one animation level above the current image overlay, using a specified LO* file for the offset position information. The new sprite inherits the direction of the current sprite. end - no parameters - destroys the current active image overlay, also removing the current sprite if the image overlay is the last in one in the current sprite. setflipstate - <flipstate> - sets flip state of the current image overlay. playsnd - <sound#> - plays a sound. playsndrand - <#sounds> <sound#> <...> - plays a random sound from a list. playsndbtwn - <firstsound#> <lastsound#> - plays a random sound between two inclusive sfxdata.dat entry IDs. domissiledmg - no parameters - causes the damage of a weapon flingy to be applied according to its weapons.dat entry. attackmelee - <#sounds> <sound#> <...> - applies damage to target without creating a flingy and plays a sound. followmaingraphic - no parameters - causes the current image overlay to display the same frame as the parent image overlay. randcondjmp - <randchance#> <labelname> - random jump, chance of performing jump depends on the parameter. turnccwise - <turnamount> - turns the flingy counterclockwise by a particular amount. turncwise - <turnamount> - turns the flingy clockwise by a particular amount. turn1cwise - no parameters - turns the flingy clockwise by one direction unit. turnrand - <turnamount> - turns the flingy a specified amount in a random direction, with a heavy bias towards turning clockwise. setspawnframe - <direction> - in specific situations, performs a natural rotation to the given direction. sigorder - <signal#> - allows the current unit's order to proceed if it has paused for an animation to be completed. 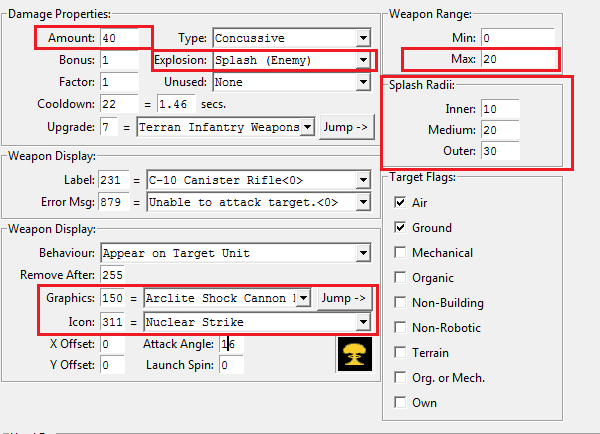 attackwith - <ground = 1, air = 2> - attack with either the ground or air weapon depending on a parameter. attack - no parameters - attack with either the ground or air weapon depending on target. castspell - no parameters - identifies when a spell should be cast in a spellcasting animation. The spell is determined by the unit's current order. useweapon - <weapon#> - makes the unit use a specific weapons.dat ID on its target. move - <movedistance> - sets the unit to move forward a certain number of pixels at the end of the current tick. 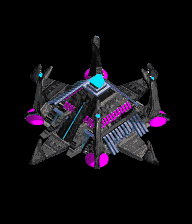 gotorepeatattk - no parameters - signals to StarCraft that after this point, when the unit's cooldown time is over, the repeat attack animation can be called. 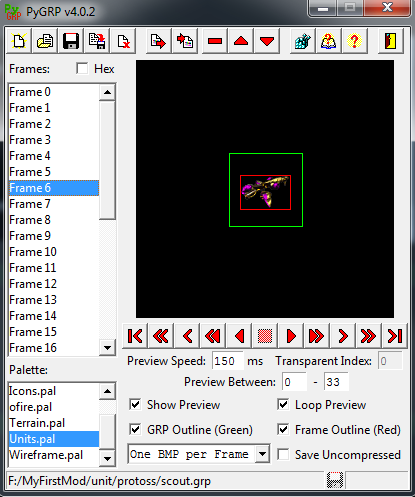 engframe - <frame#> - plays a particular frame, often used in engine glow animations. engset - <frameset#> - plays a particular frame set, often used in engine glow animations. __2d - no parameters - hypothesised to hide the current image overlay until the next animation. nobrkcodestart - no parameters - holds the processing of player orders until a nobrkcodeend is encountered. nobrkcodeend - no parameters - allows the processing of player orders after a nobrkcodestart instruction. ignorerest - no parameters - conceptually, this causes the script to stop until the next animation is called. attkshiftproj - <distance> - creates the weapon flingy at a particular distance in front of the unit. tmprmgraphicstart - no parameters - sets the current image overlay state to hidden. tmprmgraphicend - no parameters - sets the current image overlay state to visible. setfldirect - <direction> - sets the current direction of the flingy. call - <labelname> - calls a code block. return - no parameters - returns from call. setflspeed - <speed> - sets the flingy.dat speed of the current flingy. creategasoverlays - <gasoverlay#> - creates gas image overlays at offsets specified by LO* files. pwrupcondjmp - <labelname> - jumps to a code block if the current unit is a powerup and it is currently picked up. trgtrangecondjmp - <distance> <labelname> - jumps to a block depending on the distance to the target. trgtarccondjmp - <angle1> <angle2> <labelname> - jumps to a block depending on the current angle of the target. curdirectcondjmp - <angle1> <angle2> <labelname> - only for units. Jump to a code block if the current sprite is facing a particular direction. imgulnextid - <x> <y> - displays an active image overlay at the shadow animation level at a specified offset position. The image overlay that will be displayed is the one that is after the current image overlay in images.dat. __3e - no parameters - unknown. liftoffcondjmp - <labelname> - jumps to a code block when the current unit that is a building that is lifted off. warpoverlay - <frame#> - hypothesised to display the current image overlay's frame clipped to the outline of the parent image overlay. orderdone - <signal#> - most likely used with orders that continually repeat, like the Medic's healing and the Valkyrie's afterburners (which no longer exist), to clear the sigorder flag to stop the order. grdsprol - <sprite#> <x> <y> - spawns a sprite one animation level above the current image overlay at a specific offset position, but only if the current sprite is over ground-passable terrain. __43 - no parameters - unknown. dogrddamage - no parameters - applies damage like domissiledmg when on ground-unit-passable terrain. Now that we understand the syntax used in an iscript.bin entry, let's create one of our own. For this portion of the tutorial, we're going to replace the Marine graphic with the Junker. Because the graphic is very different from the Marine's, we're going to need to modify its iscript significantly. First, let's open the Junker GRP in PyGRP so that we can see what framesets it has. Framesets 0x00-0x22 are a sort of "return to idle" animation where the Junker stands up. The remaining framesets (0x33-0xbb) are the walking animation. The Marine's Init animation consists of a single opcode, imgul. 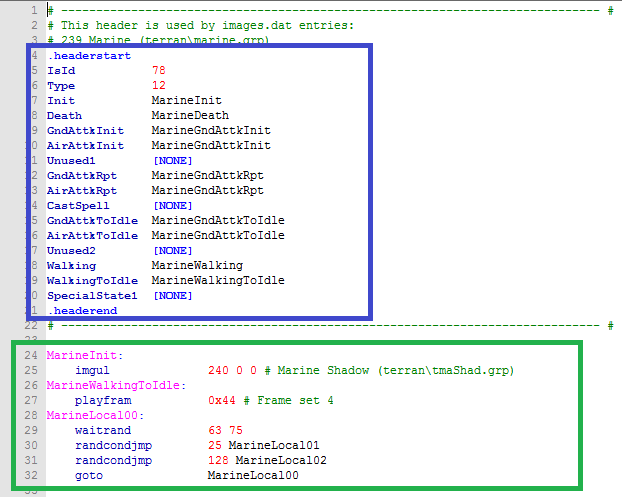 Imgul stands for "image underlay" and is used to spawn an image (in this case, the Marine's shadow) underneath the main image. There is also a correspodning "imgol" command for spawning overlays like the Archon's team colors. Imgul takes 3 parameters - an images.dat ID, an X offset and a Y offset. We still want our new Marine to have a shadow, so let's leave this opcode alone. Here we see an example of the playfram opcode. It can take either a frameset (such as 0x44) or a frame number (30). The difference is that giving a number will play a specific frame, regardless of what direction the unit is facing, while providing a frameset will play the appropriate frame for the unit's facing. We've introduced a new opcode here, wait. "wait X" causes the animation to wait X ticks, where each tick is approximately 1/10th of a second. If you've ever watched idle Marines ingame, you'll notice that they randomly turn and point their gun at things. This code block is part of what makes them do that. waitrand causes the animation to wait a random number of ticks between the two parameters. randcondjmp X label_name gives the animation a random X/256 chance of jumping to label_name. So this code block causes the Marine to wait an interval between 6-7.5 seconds, then randomly play one of three animations. Without the goto statement, the Marine's animation will move directly into its WalkingToIdle animation, which is not what we want. What's going on here? First we have playsndbtwn which, as you might have guessed, plays a random sound between the two entries given as parameters. Then we have something a little odd - a setfldirect opcode. This set's the Marine's facing direction to due north (0). Why? 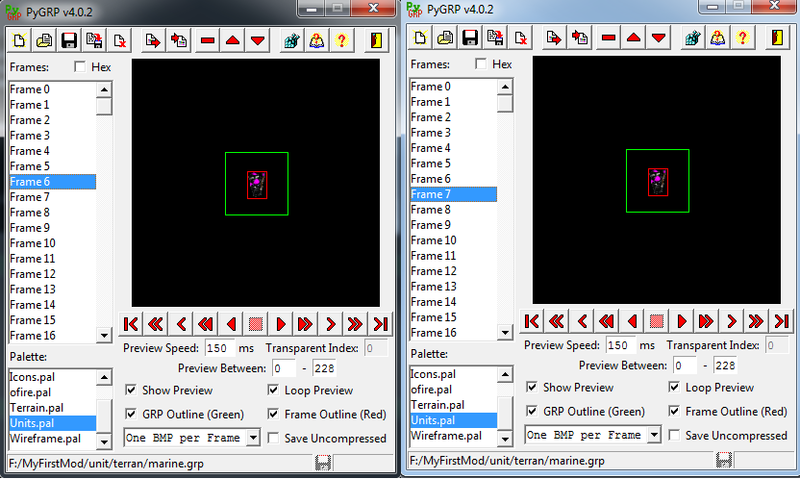 Well, if you examine the Marine's GRP you'll see that it doesn't duplicate its death frames like all the other ones. Since there isn't a complete frameset, we instead set the Marine's direction to a known quantity, then play the appropriate individual frames. At the end, we have lowsprul, which is like imgul, except it spawns a sprite entry instead. 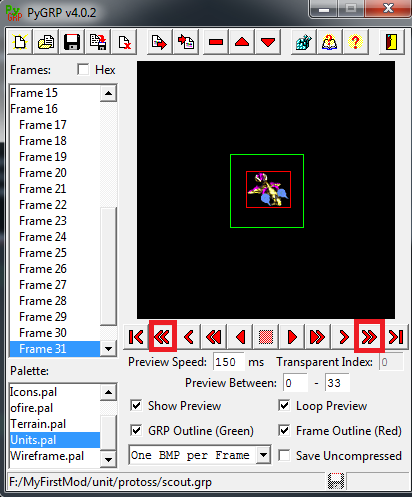 Unlike images, sprites can persist after their main image is removed. In this case, it is the bloodstain that appears after a Marine dies. Finally, we have end at the end of the animation, which simply destroys the image. In this simple death animation we play a sound, spawn the "small explosion" image and then remove the image after it has played. Why are we changing the header? SC always uses the GndAttkInit/AirAttkInit animations for the first attack, so we can't just leave them empty. Instead, we'll just point them to GndAttkRpt, which will serve as our attack animation for all cases. Here we see a few new opcodes. nobrkcodestart prevents the animation from being interrupted by any orders (aside from dying). nobrkcodeend "unlocks" the animation and allows it to be interrupted again. The Marine has an automatic rifle that fires for about half a second (rather than a single shot like the Ghost), so it'd look rather odd if it stopped firing in the middle of its animation. We also encounter for the first time the playsnd opcode (similar to playsndbtwn) and attackwith. attackwith 1/2 causes the unit to attack with either its ground weapon (1) or its air weapon (2). We have also removed the content of MarineGndAttkToIdle for the same reason. Note that we still need a MarineGndAttkToIdle animation (or need to have it point to something else in the header) or SC will crash when the unit stops attacking. In this case, I've decided to just point it back to our "wait and do nothing" local animation. Now that we've finished that up, save the script we're editing, then save the entire file as iscript.bin. In PyMPQ, add iscript.bin under the path scripts\iscript.bin. We also need to add the Junker and Junker Shadow GRPs as unit\terran\marine.grp and unit\terran\tmaShad.grp respectively. The first thing you'll notice is that this iscript entry is used by a ton of images. In fact, every shadow in the game uses this iscript entry. But how can this be? Every shadow GRP has different numbers of frames and animations. The key is the followmaingraphic opcode. This opcode causes an overlay/underlay to display the same frame number as its parent graphic. As long as you make sure that the shadow graphic has the same number of frame as the parent, you can simply use this entry and not worry about creating a new iscript entry for the shadow. Now that we know the basics of iscripting, let's spice up our Junker's animation with two simple tricks - giving it a missile barrage attack, as well as a close range flamethrower. Note that you provide radii for splash, not a length/width, and even the outer radius used by the Flame Thrower weapon is much smaller than the Firebat's actual attack. Now that you have seen the iscript we (and the Firebat) are using, this should all make sense. You might be wondering "where is the corresponding nobrkcodeend for this animation?" 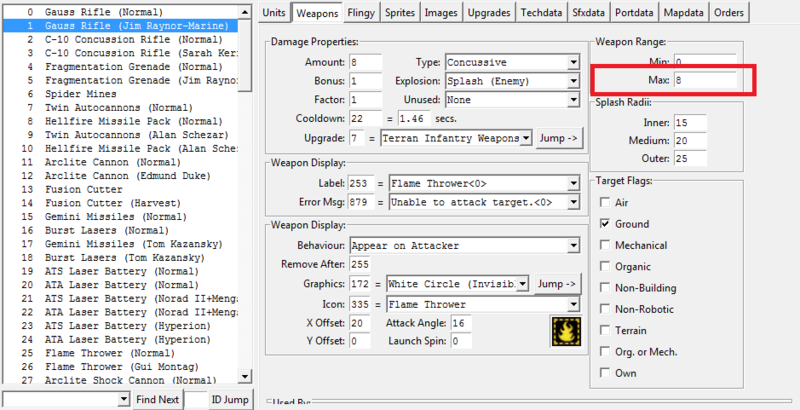 The answer is that it is actually in the flamethrower overlay's iscript! This makes it easier to prevent the unit from moving away until the flamethrower graphic has finished. Here we've done two things. First of all, we've changed the parameter given to the attackwith opcode so that the Marine attacks with its air weapon instead. Remember that we changed the ground weapon to our Flame Thower copy, so if we want it to use its missiles on ranged targets, we need to specify the air weapon. Once the attack animation has actually begun, SC doesn't care about what weapon is actually being used, so we're free to use the air weapon even in the ground attack animation. Because the weapon has both "Air" and "Ground" target flags checked in weapons.dat, it is capable of doing damage to both targets. 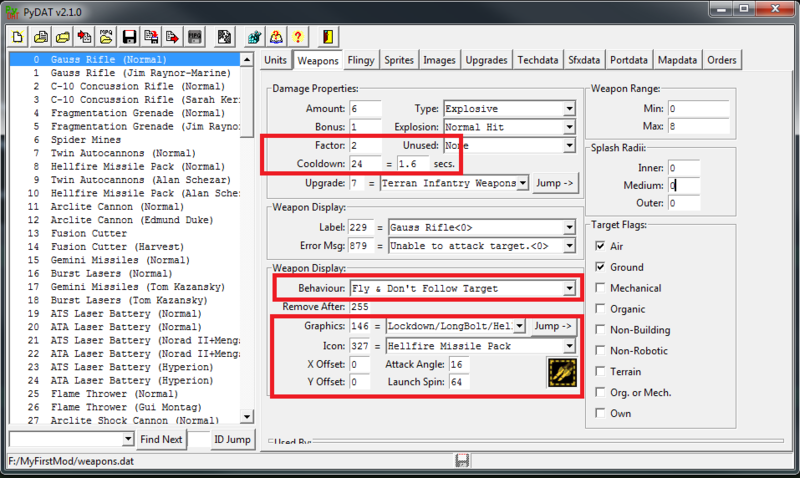 We've also added a couple more "attackwith" opcodes so that the Marine fires 3 bursts of missiles while attacking. We've added some wait opcodes in between so that the missiles are staggered, rather than being stacked on top of each other. In the next part of the tutorial, we'll put some graphical polish on our new Marines by learning how to change icons and wireframes. Post has been edited 2 time(s), last time on Sep 4 2017, 12:11 am by Voyager7456.